After spending a fine July 4 weekend with cousins Krista and Craig in Salida, Colorado, it was time to pack up the bikes and continue to head north to Canada. 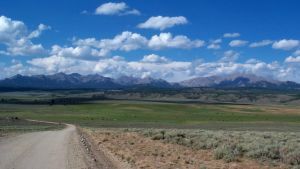 The 3000 ft. climb out of Salida was tough, but not quite as tough as the lonely, rolling, washboard trail over dry terrain heading toward Hartsel and the foot of Summit County. No trees, lots of sand, and headwinds for most of the day put this as one of our toughest days of cycling the divide. When we arrived in Hartsel, we didn't expect much - we passed through this little bump in the road on the Transam route last year. This year we would get a very different view of the town! We had read that we could camp in the 'park' at the 'town hall' - but were told by a local firefighter that camping in the park was not allowed due to people leaving trash there (almost certainly not cyclists). While cruising around, looking for a place to put up the tent for the night, we passed Doc Holliday's Cafe (specializing in buffalo), where the people outside called to us, offering the lot next to the restaurant for camping, and inviting us to a "private party" that night in honor of the first anniversary of the place's opening. After a quick 'bird-bath' to get off the day's grime, we were offered free T-bone steaks, beer and other libations, and lots of great conversation with the locals. They even had fast internet access! In Hartsel! We didn't get to bed until late - and didn't get up in the morning until later still. <wink> They even set us up with some great biscuits and gravy and coffee in the morning. We understand that the folks at Doc Holliday's are considered the 'rebels' of Hartsel - trying to clean up the town and get things going. We think that they've got a great idea going - only a short climb up over Hoosier Pass to Breckenridge, with lots of traffic on the main road during the day. Our next stop would be the old town of Como, at the foot of the climb up over Boreas Pass. Como was an old railroad town, with a line going over the Boreas Pass back in 1882. These days, the old narrow-gage tracks are pulled up, and the road takes its place, promising a nice, easy grade over the pass. We had planned to camp in Como, but kept seeing signs for "Camp Como" - what is that? An inquiry yielded the answer - a Christian youth camp in the mountains, and yes - they'd let us stay there as well. A donation for camping, hot showers, plus optional all-you-can-eat meals for $5/person. 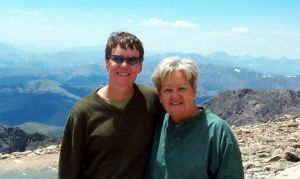 We met many very nice folks there, and enjoyed lots of great conversation with the counselors and managers of the camp. Down through Breckenridge (touristy, but beautiful as always), then a nice bike trail through Frisco and down to Silverthorne, where we'd stay for a few days rest. 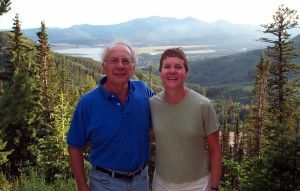 Shelley's parents, Ray and Sue, drove out again to visit us, share a few meals, explore some of the area around Summit County, and do some shopping at Silverthorne's outlet malls. How exactly are we supposed to carry stuff bought at an outlet mall while cycling? The answer - you don't. You send it home with Ray and Sue! Cycling north out of Summit County, we met up again with Krista and Craig in the town of Kremmling, and again at the Lynx Pass campground the next day - a sort of mini family reunion. Ray and Sue were not too sure about sleeping in an air mattress in the back of the Hugemobile™, but we all had a good time. 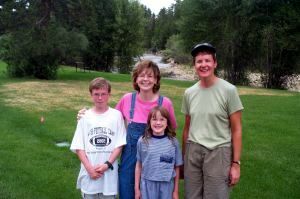 Ray and Sue would continue with us for another couple of days, stopping in Steamboat Springs, Columbine, and then leaving us as we passed into Wyoming. Our day outside Columbine included a 4WD trek in the Ford Expedition, with Sue at the wheel to tackle some very technical trails up the mountain. Who would have thought that a luxury SUV would see the dirt? Heading up to Rawlins, Wyoming, for a day off the bike and some great Mexican food at Rose's Lariat, a little dive we found last year on the Transam route. Here we met a group of 12 senior men (up to 70+ years old) cycling a segment of the transam route - they were tackling the Missoula, Montana to Pueblo, Colorado section. Leaving Rawlins brought us into the Great Divide Basin. 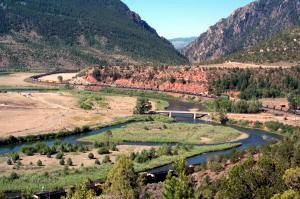 Now, when you think of the Continental Divide, you think of a line that separates the continent - all the water that falls to the west of it flows west to the Pacific, and all the water that falls east of it flows east towards the Atlantic (or the Gulf of Mexico). Not in the Great Divide Basin. Here the divide line actually splits in two, looping apart for some 3,600 square miles, then coming together again in the north. All the rain that falls inside the basin settles into temporary lakes and eventually evaporates. It is one of the emptiest, driest sections of the divide ride. However, there are herds of antelope and wild horses to keep it interesting, along with seemingly endless expanses of sagebrush and dry dirt. We loaded up with nearly 4 gallons of water each (that's over 30 pounds - 15 kg of water), in order to avoid having to search out water off-route, and headed into the basin. 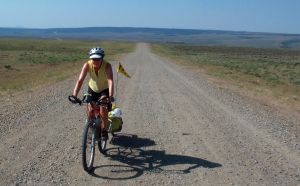 We met a cyclist coming out of the basin carrying a pet rat on the back of his bike - he called the rat "Jedediah Smith". After quickly getting updated water info, we continued on. Come 1PM the sun was hot, and we pulled over to the side of the dusty road, put up our tent, and climbed inside for a nap. 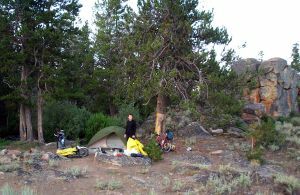 A few hours later we awoke, packed up, and continued on to another roadside campsite. Completely open - no trees - no water - with clear views all around. It was fabulous. Our next day we pushed on to the Sweetwater River, where Steve just jumped in to get 2 days of dust off. It was an oasis, right on the outside edge of the basin, with the first trees and grass we had seen in several days. We explored South Pass City, a well-preserved ghost mining town, before continuing over dry, rolling terrain to another oasis at the Little Sandy River. We've found that these small creeks and rivers where we set up camp are much more relaxing than the serviced forest service campgrounds. Pinedale, Wyoming was our first real town in four days, and brought a great surprise visitor. Sherri Len, an old high school friend of ours, had contacted us via email when she found that we were heading through her state. She actually drove 100 miles one-way to visit us! It was great to meet her husband Arlo, and her children Arik and Anna. The 20 years (ouch!) seemed to melt away, and we caught up on what our old friend have been doing, as Sherri Len had been to our 20th class reunion just a few weeks earlier. Pinedale also had the best library we've seen in a long time. Lots of bright, open space, tall timbered ceilings, and 5 iMacs with fast internet access. All in a town of less than 1200 people. The library alone helped to keep us in Pinedale for another day. We climbed up towards Union Pass, staying the night at the appropriately named Mosquito Lake. However, we were surrounded by cows all day and night in our nice grove of pine trees - and let me tell you, cows do not sleep at night. They eat. They moo. They walk around, crashing through old twigs and sticks on the ground. Oh, and since there were big Grizzly Bear warning signs all around - they sound like bears when you're trying sleep in your tent (except for the mooing part). 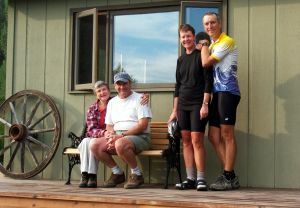 After cresting Union Pass, we came upon Jo An and Dave Martin, who have started putting up long-distance touring cyclists at their cabin. For just $15 each, they give you a nice bed, shower, use of laundry facilities, and dinner and breakfast. 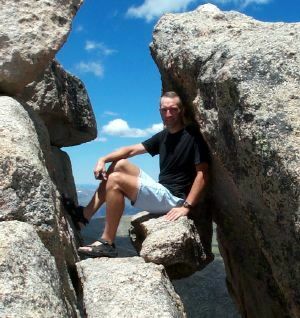 They're really not in it for the money - it's to meet the Continental Divide and Transam cyclists - both trails run right in front of their place near Dubois, Wyoming. Waking up to rain, we took the good decision to stay another day. Word of Jo An and Dave's place is now bouncing back and forth between cyclists on both the Transamerica and the Continental Divide routes - they'll probably end up like the Cookie Lady in Virigina, famous for (what else?) giving cookies to the cyclists passing by her home. 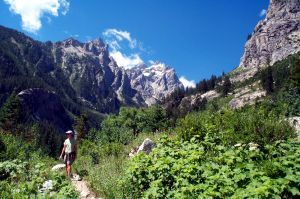 A climb up to Togwotee Pass, then a descent into Grand Teton National Park, which we visited last year, although this year the views were unobstructed by the smoke of 2001's fires near Jackson Hole. We spent a couple of days camping at Jenny Lake, a very popular campsite in the park made more popular because it is tents-only, no monster RVs and motorhomes allowed in this beautiful campground. We even got to see a glimpse of our first bear of this trip - a smallish Grizzly, although by the time we got close, the hundred or so tourists with cameras and idling cars had helped the bear move on to quieter pastures. Leaving the Tetons, we rode past the hated Flagg Ranch (way overpriced, industrial-strength resort with a bad attitude), and got another great campsite along the Grassy Lake. It's cool that just a few miles from both Yellowstone and Teton National Parks there are free forest service campgrounds - and they're generally nicer than the ones in the parks. Our next day we saw some other people enjoying the divide in a different way. A group of people taking horse drawn covered wagons on a 4 day trip. We also ran into a group of four guys cycling a section for a week, friends from work that wanted to see some of the great outdoors. They were doing it supported - one would drive the car, or they would ride loops to get back to their campsite. A great idea for people with tighter vacation schedules. Our next day was virtually all on an old abandoned rail line, now converted into a trail for bikes, horses, and other similar uses. A beautiful ride, and no cars. The southbound cyclists all commented to us that the trail was very hard to ride due to the sandy, rocky surface. We've decided that we will not trust any more southbound riders - they haven't seen rocky and sandy trails until they've hit New Mexico in June. We crossed over into Idaho, then came to the Red Rocks Wildlife Refuge, home of many birds, including the endangered Trumpeter Swan. We could hear it's interesting call through the evening from our campsite in a treeless pasture, the setting sun playing wonderful red lights on the rolling hills all around us. We are now in the small town of Lima, Montana (Idaho was a short state - only 73 miles), and have our first hotel room in 2 weeks. Funny, I kind of miss the tent already - I wonder if we can sleep in that big bed? Great Divide Basin, outside Rawlins, WY.